My name is Ashleigh and I am currently in my third year of studying Paramedic Science. In between my second and third year I decided to head to Guadalajara for what was meant to be three weeks (I ended up staying for 5). I decided to undertake this volunteer placement to expose myself to the diverse culture of Mexico. I also thought that it would be a great learning experience for trauma emergencies – I wasn’t wrong! My first week was spent in the emergency department of Cruz Roja (Red Cross). Cruz Roja was approximately a 30 minute walk from my host family so I often walked with other volunteers to see the beautiful city of Guadalajara. The doctors at Cruz Roja were very welcoming, spoke good English and loved making sure I was getting involved. Throughout the week I worked mostly from 7am-2pm and would sometimes go in for the evening. Cruz Roja was quieter than I had expected but I still experienced more than I have on placements at home. I then asked if I was able to work at Cruz Verde (Green Cross) and that was not a problem. This was where I would make friends and memories that would last a life time! I worked a couple of shifts in the emergency department before spending the rest of my time in the ambulance. In the clinic I was accompanied by the student doctors, who again spoke good English. The level of trust the doctors held within other volunteers and I was incredible! The highlight of my time in the clinic was learning to suture and watching small surgeries (well attempting to). Throughout my time working as the third person in the ambulance, I experienced things I would have never imagined! Again, the ambulance service was quieter than I had expected, I believe this is due to the cost, most people prefer to drive themselves (yes people will drive a family member in cardiac arrest to the hospital). In saying this, I still attended a car or motorbike accident every single day. Other cases I frequently attended to included; cardiac arrests, strokes, diabetic emergencies, shootings and stabbings! I attended many interesting, unusual and at times very rewarding cases. The one case that stood out for me the most was a multi casualty accident involving two police cars and approximately 20 pedestrians. Being my first major trauma incident, this case was obviously very hard for me. However I feel as though it has developed me into a better paramedic. The biggest learning point gained from this experience was that sometimes words are not needed. The feeling of being able to comfort and care for a number of seriously injured causalities, who did not speak my language, was a truly rewarding experience that I will carry with me forever. 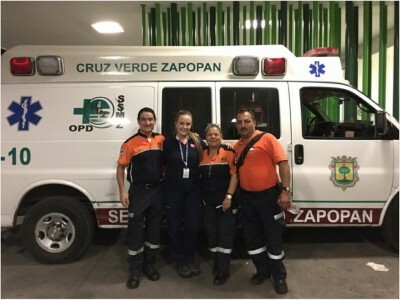 The paramedics at Cruz Verde were no doubt some of the most caring people I have ever met. They were all very welcoming and constantly asked if I was okay – making me feel at home. They always insisted on taking me for tacos or hotdogs (strongly recommend) even if it was 2am. I made friendships that I know will last a lifetime. I worked around the clock, often doing consecutive 18 hour shifts, although you can work as much or as little as you like! Overall my experience with Global Medical Projects was nothing short of incredible. The GMP staff were all very welcoming before and during my stay. Kevin was a great help with any concerns prior to my trip and always replied as soon as possible. He also insured I was more than comfortable and made fast arrangements when I decided to stay for an extra two weeks. 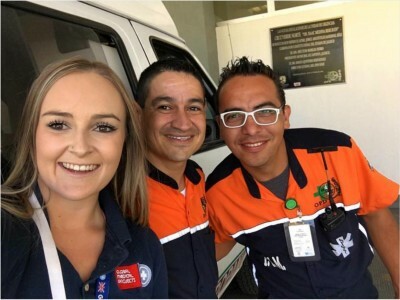 The GMP staff in Guadalajara work around the clock to always insure you are safe and are more than happy to show you around and help with any concerns. My recommendation for anyone considering taking this trip of a life time is to just do it! Step out of your comfort zone and I can promise you it will be more than worth it. Learn as much Spanish as possible, drink as much tequila as possible, eat as many tacos as possible, but most of all have the absolute time of your life! I am already considering planning a trip back!